Get 14 latest news headlines daily with The Tutors Academy. 2. Union Minister Arun Jaitley on Thursday resumed duties as the country’s Finance and Corporate Affairs Minister after a gap of three months during which he underwent a kidney transplant surgery. 3. Veteran journalist and former Rajya Sabha member Kuldip Nayar passed away at 12.30 a.m. on Thursday after a brief illness. He was 95. Mr. Nayar was known for his stand against the Indira Gandhi government during the Emergency as the Editor of The Statesman. He was arrested for his vocal protest during the time. Mr. Nayar will also be remembered as a human rights activist and peacenik, and a former High Commissioner of India to the United Kingdom. 4. 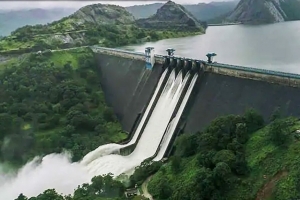 The impact assessment of climate warming on hydropower production was carried out at seven large reservoirs in India — Nathpa Jhakri, Bhakra Nangal, Srisailam, Nagarjuna Sagar, Hirakud, Sardar Sarovar, and Indira Sagar. Of the seven reservoirs, Nathpa Jhakri, Bhakra Nangal are located on Satluj River, and snowmelt is one major source of water, which is likely to change under the future climate. The other five are primarily located in the monsoon-dominated climate region in central-south India. 6. 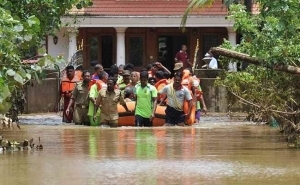 In refusing foreign aid for the rehabilitation of flood-hit Kerala, the Centre has followed a 14-year convention it “inherited” from previous governments of not accepting such assistance in the face of natural calamities, Union minister K.J. Alphons said on Thursday. 7. Jammu and Kashmir (J&K) was an integral part of the Dominion of India, according to the Instrument of Accession which was signed by Maharaja Hari Singh on October 26, 1947 and subsequently ratified by the Constituent Assembly of J&K. Article 35A was born through a Presidential Order, the Constitution (Application to Jammu and Kashmir) Order of 1954. Therefore, it was added to the Constitution without undergoing the procedure for constitutional amendments as laid down in Article 368. The Presidential Order was issued in exercise of the power conferred under Article 370 (1) (d) of the Constitution. Whether such power also extends to inserting a new Article in the Constitution is contentious. The heading of Article 35A reads: “saving of laws with respect to permanent residents and their rights”. Article 35A declares that any law enacted by the J&K State Legislature on the issues of permanent residence, or special privileges and rights, or imposition of restrictions, or employment, acquisition of immovable property and settlement in the State, or aid from the State government shall not be void on the ground that it is inconsistent with any rights conferred on other citizens of India. In short, such laws granting special rights to permanent residents would not be deemed a violation of the fundamental rights of other citizens. The challenge to Article 35A rests on two constructs. The first is that it was inserted unconstitutionally, bypassing Article 368 which empowers only Parliament to amend the Constitution. The second is that the laws enacted in pursuance of Article 35A are ultra vires of the fundamental rights conferred by Part III of the Constitution, especially, and not limited to, Articles 14 (right to equality) and 21 (protection of life). This refers to a puzzle about the probabilities of a tossed coin landing heads up and tails up. According to it, Sleeping Beauty, the popular fairytale character, is first put to sleep by researchers on a Sunday. A coin is then tossed and Sleeping Beauty is woken up on Monday if it lands heads up. However, if the coin lands tails up, she is put back to sleep on Monday with her memory erased and woken up the next day. At the end of the experiment, Sleeping Beauty is asked about the probability of the coin having landed heads and tails up. Some have argued that the probabilities are equal; others say the coin landing heads up is more likely. 9. Senior BJP leader from Uttar Pradesh Lalji Tandon was sworn in as Bihar Governor on Thursday. He replaced Satya Pal Malik, who was appointed Governor of Jammu and Kashmir. Mr. Tandon was administered oath of office by Patna High Court Chief Justice Mukesh Rasik Bhai Shah. 10. India and China on Thursday agreed to work towards full implementation of ongoing confidence-building measures (CBM) along the border as well as improve military to military interactions. This was agreed during bilateral consultations between Defence Minister Nirmala Sitharaman and visiting Chinese State Councillor and Defence Minister General Wei Fenghe. “It was decided to expand the engagement between the Armed Forces relating to training, joint exercises and other professional interactions. Both sides also decided to work towards a new bilateral Memorandum of Understanding (MoU) on defence exchanges and cooperation to replace the MoU signed in 2006,” the Defence Ministry said in a statement. General Wei is on a four-day visit to India, which comes exactly a year after the 73-day military stand-off at Doklam. The 27-member delegation accompanying him consists of key military officials, including Vice Chief of the Central Military Commission Air Marshal Dingqui Chang and Lieutenant General Guiqing Rong, Vice Commander of the Western Theatre Command, which handles the entire border with India. 11. Setting aside its ban on the sale of oxytocin, the Health Ministry has allowed private retail stores to sell the life-saving hormone from September 1, an official said on Thursday. State-owned Karnataka Antibiotics Pvt Ltd will be the only company to manufacture and distribute oxytocin in India from September 1. The government has already banned the import of oxytocin. 12. Dr.Reddy’s Laboratories on Thursday said its API plant in Srikakulam SEZ, Andhra Pradesh, has received an establishment inspection report (EIR) from the US Food and Drug Administration (USFDA). The EIR indicates closure of the audit initiated by the USFDA, the drug maker said in a regulatory filing. On June 2, the company had informed that the regulator had completed the audit without making any observation. 13. Fifteen-year-old Shardul Vihan on Thursday became the youngest Indian shooter to win a medal at the Asian Games after he finished second in the men’s double trap here, extending the sensational run of teenaged shooters from the country. Vihan’s silver was India’s eighth medal from the Jakabaring Shooting Range. 14. A new satellite that will use advanced laser technology to track global winds and improve weather forecasts has been successfully put into orbit, launch company Arianespace said. The launch of the “Aeolus” satellite took place at 2120 GMT on Wednesday. Meaning – Having or displaying a friendly and pleasant manner.